If you haven’t heard of this ice show yet, you haven’t read the newspaper in three months. Okay, granted for this target audience, that is a distinct possibility. But now you know. This remake of the 2001 show (which I didn’t see) is expanded. 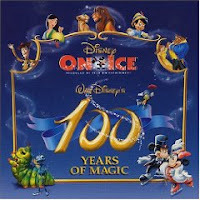 It features Mickey Mouse narrating through 18 stories and 65 characters. You’ll know them all – Snow White, Buzz Lightyear, Nemo, the Lion King and the rest of them.